GERMANY: A group of wind organisations has called for the cap on offshore installations to be increased as the total fleet grew by 626MW in H1 2017. Following the recent auction results from which projects will be built and operated without support from the mid 2020s, the country's main wind sector organisations called for the current cap of 15GW in 2030 to be raised to at least 20GW by 2030 and 30GW by 2035. The group includes the Working Group for Offshore Wind Energy (AGOW), German wind energy association BWE, the German Offshore Wind Energy Foundation, VDMA Power Systems trade body and the Wind Energy Agency for the north-west region. In April, Dong and EnBW won licences for 1.38GW of offshore wind to be built without subsidy, in Germany' first competitive offshore wind auction. The German offshore wind sector connected 108 turbines with a total 626MW to the grid in the first six months of 2017. 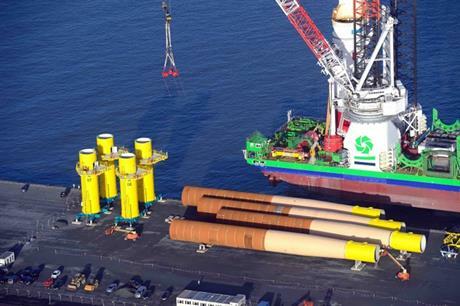 The total German offshore wind fleet now stands at 1,055 turbines totalling 4,749MW. Turbines for another 295.8MW were installed over the period but are not yet commissioned. The newly commissioned turbines were installed in an average water depth of 35 metres and 88km from shore. The average for all turbines installed in German projects is 29 metres water depth and 69km from shore. Capacity additions for whole year 2017 are expected to reach 900MW, according to the joint report by wind organisations. Offshore wind generation amounted to 8.5TWh in the January to June 2017 period. This was already 70% of the full year volume of 12.4TWh generated in 2016, they said.